This week marks the birthdays of two famous Confederate generals: Robert E. Lee and Thomas “Stonewall” Jackson. Lee’s birthday was yesterday, January 19, and Jackson’s birthday is tomorrow, January 21. 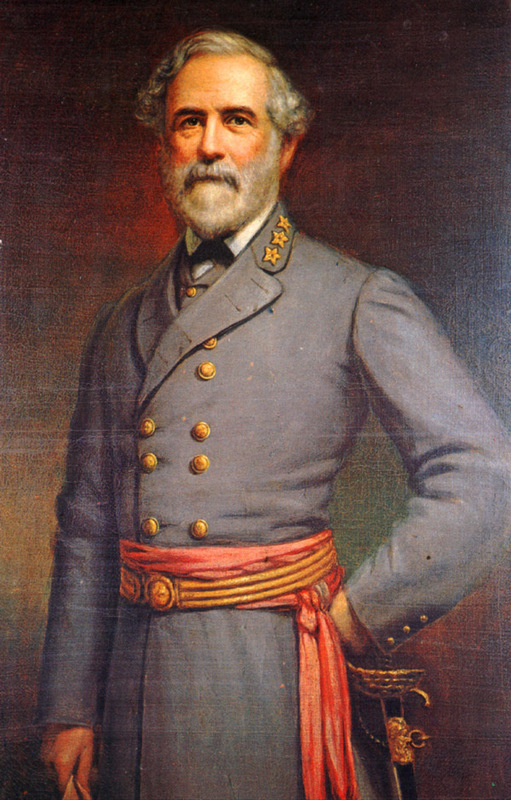 Robert E. Lee was born on January 19, 1807. He was a son of the famous Revolutionary War hero, “Light Horse Harry” Lee. Robert E. Lee’s upbringing was atypical of Virginia gentry. Although his first home was at Stratford Hall (a beautiful plantation in Virginia that is now a tourist attraction), Lee’s family moved to Alexandria when he was four because his father was thrown into debtor’s prison. Robert E. Lee was accepted into West Point Military Academy in 1825, where he excelled and graduated at the top of his class with no demerits. He served as a military engineer, and married Mary Custis, the great-granddaughter of Martha Washington, at Arlington House. After fighting in the Mexican War, Lee continued with the United States military until Virginia seceded in April, 1861. He then decided to stay true to his state, so he resigned his commission. He served under Confederate President Jefferson Davis, who eventually gave Lee total control of the Confederate Army. During the first two years of the war, Lee and Jackson fought side-by-side in several battles. Following his surrender at Appomattox on April 9, 1865, Lee served as the President of Washington and Lee University in Lexington. His tenure was short-lived, however. He died on October 12, 1870, and is buried on campus. Lee was a true patriot, hero, and gentleman. He was deeply religious, and was greatly admired and respected by his men, as well as his students and the citizens of Lexington. Thomas J. Jackson, born on January 21, 1824, was also a deeply religious man. He was sometimes ridiculed for his peculiar, eccentric behavior. Jackson was extremely shy, but after a harsh upbringing, he learned to read, and managed to graduate from West Point in 1846. He fought in the Mexican War, where he met Robert E. Lee. In 1851, Jackson became a professor at the Virginia Military Institute (VMI) in Lexington, Virginia, where his teaching methods received criticism. His first wife died in childbirth, but he remarried a few years later. When the Civil War broke out, Jackson was assigned to Harpers Ferry, where he commanded the “Stonewall Brigade.” His strategic military genius helped win battles at First and Second Manassas, the Peninsula and Valley Campaigns, and the Battle of Fredericksburg. During the Battle of Chancellorsville in May, 1863, Jackson was mistaken for the enemy by his own men and wounded. His arm was amputated, and it was thought he would recover. But after eight days, he succumbed to pneumonia. He died on May 10, 1863, and is buried in Lexington Cemetery (his left arm is buried at Ellwood Manor). Lee and Jackson were two of the most prolific generals of the Civil War. Their religious conviction and military genius will always be admired and revered. 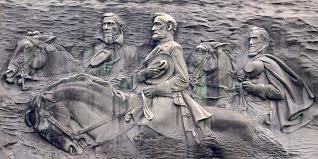 Both men, along with Jefferson Davis, are featured in the carving on Stone Mountain, Georgia. On this date in 1862, Confederate Colonel Turner Ashby met his fate at the Battle of Good’s Farm. Ashby’s grandeur so captivated the South that he was compared to a knight, a pirate, and a crusader. 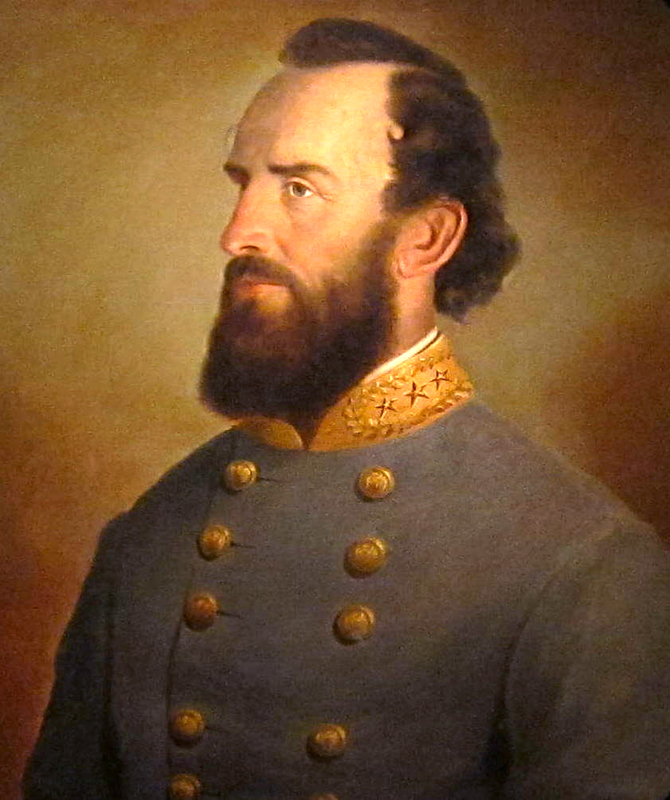 He was a superb horseman and a daring soldier under the command of Stonewall Jackson. He customarily rode a beautiful white horse, regardless of the additional danger. He was third generation military. His grandfather, Jack, fought as a captain in the Revolutionary War, and his father served as a colonel in the War of 1812. As was the case with most Southern gentry at the time, Ashby was an accomplished horseman. His favorite pastime was fox hunting, and he competed frequently in jousting tournaments, almost always placing first. When Virginia left the Union on April 17, 1861, Ashby persuaded Governor John Letcher to order the state’s militia to capture the federal arsenal at Harpers’ Ferry. Arriving too late, Ashby found most of the buildings and the 15,000 small arms located in the arsenal burned by Union troops. Ashby’s Rangers remained in the area, patrolling the fords of the Potomac River, and bridges spanning from both Harpers Ferry and Point of Rocks, Maryland. The Rangers disrupted the Baltimore and Ohio Railroad, and obstructed the passage of boats on the Chesapeake and Ohio Canal, otherwise known as the grand old ditch. Ashby was an adventure seeker, and commonly went on scouting rides and inspections alone. His appearance was striking, setting him apart from other soldiers. Along with his tall stature of 5’-10”, Ashby had a thick black beard reaching down to his chest, a swirling long mustache to match, mahogany brown eyes, and a dark complexion. His demeanor was quiet, and his manners befitted the position he held within an old Virginia family. Like many cavalrymen of his day, he was attracted to gaudy trappings, and could be seen donning gauntlets. He secured a brass spyglass on one side of his saddle and a fox hunting horn on the other. To enhance his appearance, he always rode either a coal black horse or a pure white horse named Tom Telegraph. They were the finest horses the vicinity had to offer, and bestowed upon Ashby the knightly prowess that inspired his men to give him the moniker, the Black Knight of the Confederacy. On several occasions, the phantom-like Colonel Ashby on his snowy white horse could be seen sitting atop a hill above the Federals, provoking them. The bluecoats rode furiously to catch him. Ashby patiently waited until they were close. He then casually cantered off and disappeared before they arrived, only to reappear on another distant hill crest. On June 6, 1862, the 1st New Jersey Cavalry attacked Ashby in an attempt to capture him. After Ashby’s horse was shot out from under him, he charged toward his foe on foot, but was shot through the heart. Turner Ashby died instantly. He was thirty-three years old. Because of his remarkable reputation and service record, he was deeply mourned by the Southern people. His body was wrapped in a Confederate flag and taken to the Frank Kemper House in Port Republic for viewing. Turner Ashby was buried with honors at the University of Virginia. He became a legend in his own time, and so impressed people that the thought of him brought back fond memories. To this day, many Shenandoah localities celebrate Confederate Memorial Day on June 6, the anniversary of Ashby’s death.